September | 2015 | Planet Pedro! It was early evening, and an extremely large and rather ugly man was heavily strumming a very large and rather beautiful lute-like instrument. Later that evening, after dinner, we took another walk past the café and found a music evening in full swing. The ugly man with the stringed instrument (later identified as a laouto) had been joined by a younger man complete with a lyra. Occasionally, the younger man handed the lyra over to someone else, and danced wild leaping steps. Café Kriti was a dump: the koniak and raki were 30 drachmas; wine by the glass was topped up from half-finished empties, the toilet was the worst in Greece (which at the time took some doing): but the music was like nothing on earth we had ever heard before. In later years, we had some more great Kritiki nights, for example, an evening in Paleochora in 1989. In this case, the performer was Michaelis Tzouganakis. From then on, the pick-up trucks start arriving with families coming down from their farms and outlying villages, unloading their daughters dressed up to the nines, while the sons come down on their mopeds. The band comes on, and plays. And plays and plays. And plays some more. The families dance and sing, and eat and drink. The wine is replaced by raki. Then someone pulls an automatic pistol and fires it from his table in approval, across the road and over the beach road opposite. Hopefully it is blanks. But around 3:00 am, he fires the pistol skywards, unfortunately into the crown of an electric supply post, plunging the place into darkness. He has not been firing blanks and the concert is over. Not every experience has been as dramatic, but we have generally had at least one great Kritiki experience every time we have been to Crete. The counterpoint occasion was again, a telegraph pole poster concert, by coincidence in Paleochora. The venue was the Sunset café, and the artist was Kostis Avissinos, of a great Cretan musical dynasty. So we turn up suitably late and just catch the beginning of an unusually prompt start (within an hour of advertised time) and find ourselves watching and hearing an absolute masterclass from one of the legends of Kritiki. It was like finding Richard Thompson in your local pub, playing to twenty people. An astonishing event and a great musical experience. So where do you to hear Kritiki? There are two parts to the answer. Many of the best events are not regular club (or kentro) nights: they are once in month or once in a season, and are advertised on posters on those telegraph poles, on trees and anywhere else where they might catch the eye, sometimes in the middle of the countryside. However, there are excellent fixed venues, despite the demise of Café Kriti. This year we saw different bands play in three different tavernas on four consecutive nights in Chania: Faka (where we saw Andreas Lilikakis); To Xani, a brilliant taverna in the shadow of the old Chania Synagogue, which is acknowledged by the inclusion of old Greek-Jewish dishes on the menu, and where we had the privilege and joy to be invited to join an engagement party. Finally, we were in Ta Chalkina. As their flashy website shows, the surroundings could not be more different, but by coincidence (or perhaps not) it is on the site of the old Café Kriti, down on the harbour. Likewise, the ethos is different: where the old place was amateur and makeshift, this new venue is efficient and professional, which is a good thing. Not only does it mean good sound systems and efficient and hygienic service, as well as good authentic food (the Askyfou lamb is just sheep meat on a plate, and the sheepiest thing I have ever eaten), it shows that there is an audience for this fantastic music which justifies big investment. The concert? Well, another good feature of the place is that you can book a table for 8:30 and the music begins sometime between 9:30 and 10:00, inside (which is more atmospheric and may include dancing) and outside (which is cooler and more comfortable.) The band was very good the night we were there, although a little bit folk-rock, in that it had bass and drums – guys, it slows down the changes and makes it a bit samey – but still great tunes and songs in a tremendous setting. Kritiki is in good health here, as it is elsewhere on the island: for example in Café Mesostratis in Rethymnon. The second answer is that unfortunately, live Kritiki is hard to find in the UK, although there was a band played on the Renfrew Ferry in Glasgow about ten years ago as a part of a week of Greek culture run by the Scottish Greek community. We have a dream that one day one of the great Greek restaurants in Glasgow – both Elia and Yiamas have Cretan connections – will put on a kentro night, perhaps for Celtic Connections. A set price authentic menu, wine and drinks extra, a Kritiki band and a dance floor on a cold and wet January night: it would be like winter in Anogia or Zaros. Certainly, the music has a lot in common with the likes of the fantastic stuff played by the likes of Finlay Macdonald and Chris Stout, as shown here, especially from 2:50 onwards. Or a double bill: Celts and Kritiki. What about it someone? To the next forty hours in hell. Posted on 09/24/2015 by planetpedro CommentsNo Comments on My first poetry prize cheque – and anthologised poem! 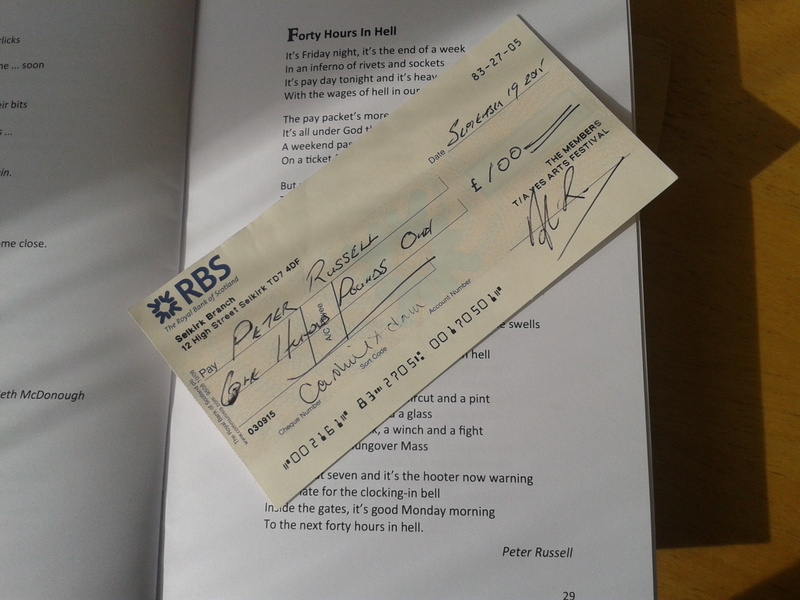 My first poetry prize cheque – and anthologised poem! Posted on 09/23/2015 by planetpedro CommentsNo Comments on Better Together: Happy Anniversary. It was of course too much to hope that the SNP and its supporters would accept the outcome of the independence referendum as having settled the issue for “a generation” or “a lifetime” (although that is what they said at the time.) However, the extended nature of the debate does allow for examination of some of its component ideas. One such idea is that it is “the natural condition of a nation to be self-governing.” To the Nationalist, this is of course an article of faith, as is its immediate application, i.e., that Scotland is a nation, and ipso facto, Scotland should govern itself. However, there are two huge failings in this argument. The first is that a nation does not become one just be wishing it or defining it as such in one’s own terms. Having a flag is not enough: each US state has its own flag (and anthem and Great Seal and even state bird) without being a nation state. Likewise in other devolved and federal states: even when its components are vested with considerable powers, they are subsumed within greater whole: in provincial Canada, in cantonal Switzerland and in federal Germany. The other argument is functional. The question is: how does a territory operate as an independent actor, in its economy, and in its consequential politics? Again , the analogy of the USA or those other devolved and federal states is useful: in each of them, there is a common currency, a common workforce, a common market and common access to resources. These are the four Ms or classic components of a unitary economy: Money, Manpower, Markets and Materials. It is does not follow from this of course that Scotland could not function independently from the rest of the UK: just that it in doing so it would lose automatic access to wider and greater sources of each: capital for investment, a workforce without visa, passport and qualification equivalence requirements, larger numbers of potential customers and their wholesale networks, and – now increasingly – the knowledge economy which represents modern resources. Within the single nation state UK economy, Scotland has access to the Pound, no if or buts; but as was made clear in the independence debate, the remainder UK would take a lot of convincing to include a separate Scotland with different economic policies in a putative future Sterling area. It is more likely that they would choose a short term quantifiable hit through losing Scotland to an indefinite and unquantifiable risk of keeping it within an asymmetrical currency union. Investors would then make their decisions accordingly. Likewise, the workforce policy of the independence White Paper was for greater immigration than to the remainder UK. Again, such a process would be difficult, especially in the light of the desperation for many to reach England. In such circumstances a more liberal Scottish policy could easily lead to the need for a formal and perhaps closed border. In these examples, which could be expanded to include markets and materials, the automatic access enjoyed in the UK would become conditional and transactional for an independent Scotland. In some cases, this might be covered by EU membership (if Scotland were allowed membership and if the UK votes to remain in membership), and indeed none is insurmountable. The point is that automatic access will have been lost, and with it extra transactional procedures incurred, with lesser and greater degrees of frictional inconvenience and costs. This exposes possibly one of the greatest of values of the UK, and one of the greatest threats of independence: the value of co-operation and collaboration. This is as true in many other fields as it is in the economy, and stems from a fact so simple that it can be overlooked and taken for granted: throughout its development to a modern society, Scotland has been part of the UK. This process started with the Glorious Revolution, which cemented the idea of a state founded on common sovereignty rather than on absolutism – which was imported from the Netherlands by William of Orange and Mary Stuart (of that Scottish dynasty). Shortly after, this same principle was accepted by the Scots under Treaty of Union, and since 1707, the entire parliamentary system has evolved and adapted itself as a means of governance of all parts of the UK: the Reform Acts, Lords reform, universal suffrage, votes at 18, devolution have all contributed to this organically (if sometimes, as in the latter case, unevenly) across all parts of the UK. It follows that despite the continuation a separate legal system and religious settlement, Scotland has shared in the development of the widest possible range of governmental and non-governmental institutions. In economic development, for example, Cluster Theory, as described by Michael Porter, it is the combination of the various elements that matters as much as the elements itself, as value is added all along the production chain. The same principle can be seen to apply through a wider range of activities. The same applies in various fractal degrees in the armed forces, in large and medium sized-companies, supply chains within industries and so on. A further great example is the scientific research community, as was shown brilliantly in the referendum campaign by Professor Hugh Pennington and his Better Together colleagues: a research community which has developed over decades and centuries together will have a structure which suits its size perfectly, and within which Scotland’s institutions have prospered disproportionately. These scientists are direct descendants of Adam Smith, who in 1759 was one of the first to visit the newly opened British Museum, because he had free access to the finest collection in Europe; or of Sir Alexander Fleming, who took his Scottish genius to London, where he discovered penicillin, which was developed and refined by St Mary’s, Paddington. Likewise, the voluntary sector includes many organisations which are “UK” designated or “Royal National” have grown up as UK-wide and therefore this is their best fit. Finally, another great example is sport. If Scottish athletes – from Kenny Dalglish to Sir Chris Hoy – reach world class in the modern world, it is through their status in the UK rather than in Scotland. There is no doubt that in all of these fields, Scots could succeed: to deny that would be to accept the assertion of John Swinney of the SNP that we are too “too wee, too poor, to stupid.” However, to set ourselves aside from the UK would be the height of folly. Not only would there be substantial set- up and other frictional costs, but the scale and the connectedness of the UK as it stands, with automatic access to shared resources, is a significant competitive advantage. It is the difference between getting by separately and thriving as part of the union. For most functional purposes, Scotland ceased to be nation in 1707, when it became part of the UK, and from which process it has gained and prospered. Therefore Scotland’s natural state of self-government is that exercised through Westminster, as we are and will remain Better Together. 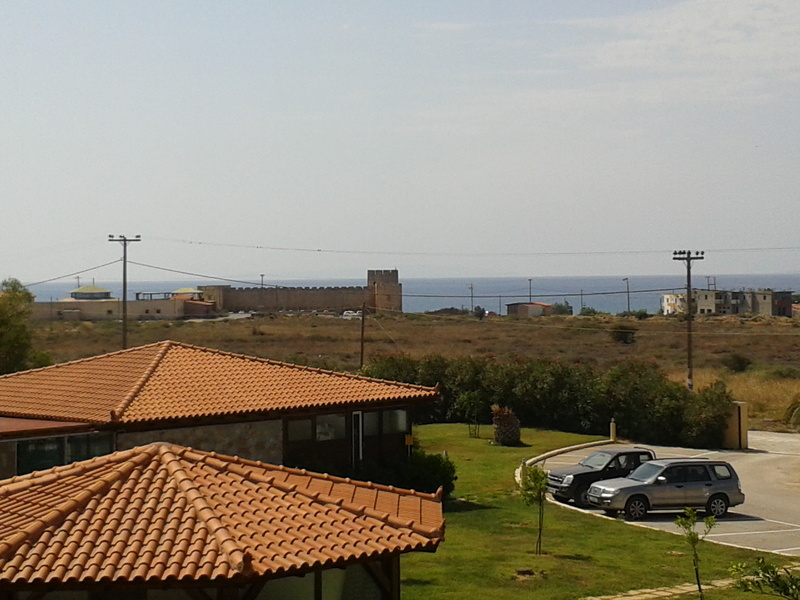 Posted on 09/18/2015 by planetpedro CommentsNo Comments on Frangokastello, Crete. …where we celebrate the Scots saying “OXI” to end Enosis with the rest of the UK, one year ago today.